Boston Market is enticing families to buy their packaged and prepared holiday meals to go this year. As they say, it's "all of the deliciousness, none of the exhaustioness." 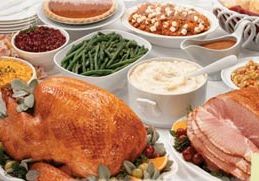 The "Complete Holiday Whole Turkey Banquet for 12" is $68.95 and includes an 11 lb. Whole Turkey, Spinach Artichoke dip with crackers, Homestyle Mashed Potatoes, Stuffing, Cranberry Walnut Relish, Gravy, 2 Cornbread Loaves, 1 Apple and 1 Pumpkin pie. Other meal combinations are available as are a la Carte entrees, sides and desserts. purchased the 11 lb turkey and gravy, order it ahead by 4 days and wound up picking up a semifrozen, tastless lump even after the store asked me to come back and give them an extra 2 hours.